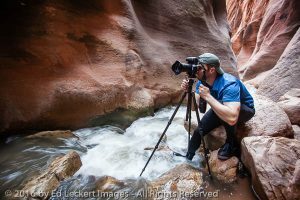 As I’ve mentioned in recent articles, my friend Jeremy and I had planned to photograph the famous river canyon at The Narrows in Zion National Park, but were blocked by dangerously high flow rates. But that didn’t stop us from river canyon hiking for long. 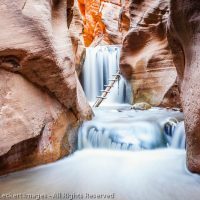 Our backup plan was to hike a small canyon in Kanarra Creek near Kanarraville, Utah. It is tiny in comparison to The Narrows, but it wasn’t much affected by the recent rains and was really the only choice we had, now that The Narrows was off the table. Waders were not absolutely required, and we saw a lot of hikers in nothing but shorts and sandals, but they all looked like they wished they had stayed home that day rather then brave the frigid water up to their waists with no protection. My favorite that day was the guy carrying a baby on his back as he came down a slippery makeshift ladder past one of the waterfalls in the canyon. Seriously, people? 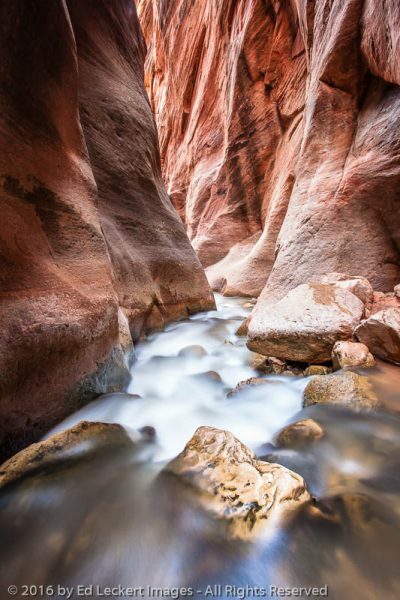 Kanarra Creek passes between narrow canyon walls, near Kanarraville, Utah. Anyway, we parked the car in the lot at the trailhead provided by the town of Kanarraville, paid our parking fee, and headed down the trail, waders slung over our shoulders. 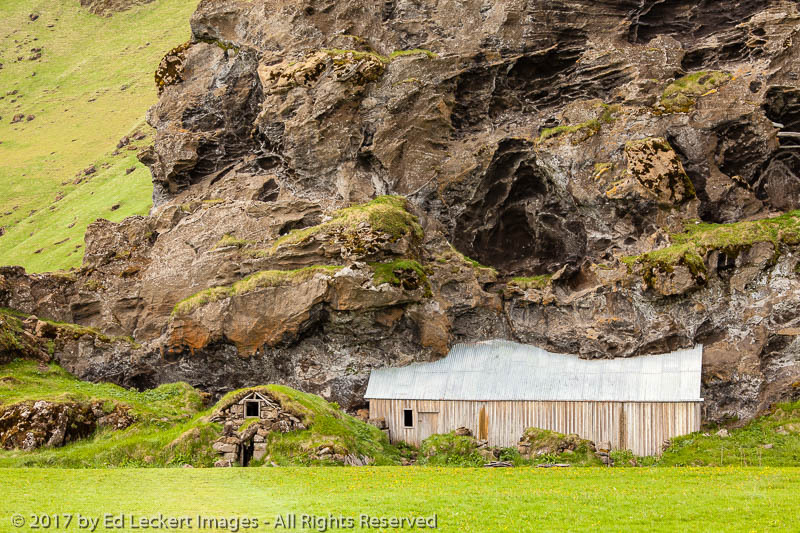 It was another hot and sunny day, the rains and clouds of the start of our trip long gone. Having never hiked this trail before, we would wonder as we approached each creek crossing whether this was the appropriate place to don our waders. We do creek crossings all the time when hiking with The Mountaineers, so we’re not afraid to get our boots wet when we have to. But on the other hand, we don’t usually have waders with us, so why get wet if we don’t have to? So we kept asking folks when we would be entering the creek “for good”, not being able to see around the next corner of the curvy trail, and hopped along on rocks through each crossing until we reached the point where it was too deep to do that without getting soaked. I had never worn my new waders before, and wasn’t sure if the built-in boots would have enough traction on the slippery rocks. I was also concerned about getting punctures through the sole on the sharp rocks in the creek bed. After all, once waders get punctured, they’re pretty much useless. But the rubber soles gave me a good grip on the creek bottom, and they were thick enough to keep me out of trouble, so we hiked through the hypothermic waters with no trouble at all. Jeremy photographs in Kanarra Creek Canyon, near Kanarraville, Utah. After a while we came to a bend in the creek where sediment had been built up enough to create a bit of riverbank on one side. 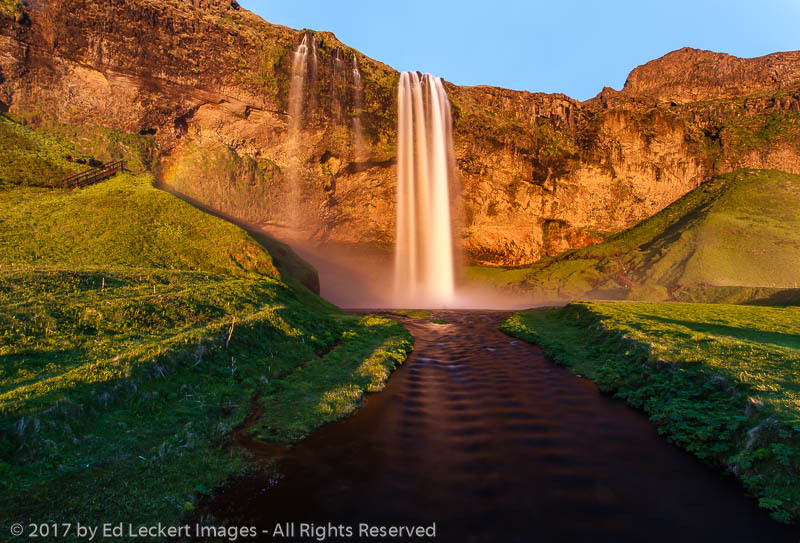 We both saw this as the perfect place to remove our backpacks and get our camera gear out of the drybags we were using to protect them in case of an accidental plunge into the water. We took turns shooting from the center of the creek, and I photographed Jeremy while awaiting my turn at the prime real-estate. 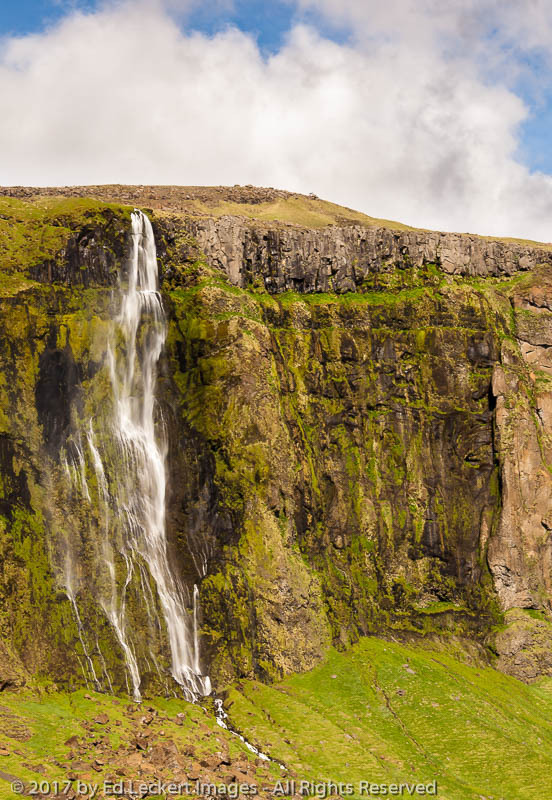 This is also the point where we saw the young family come scrambling over the falls and down the ladder, toddlers in hand and infant in the backpack. We were both happy to see them leave the area without incident. After shooting here we poked around a bit more, but this turned out to be the best spot we could find to photograph in the canyon. We eventually headed back down the trail and back to our base in Hurricane. We didn’t have any particular place we had picked out for a sunset shoot, so all we had to do that evening was pick out a good spot for dinner and get ready for another day of shooting. So what’s up next? Why, more sandstone, of course! And this time we get to do some scrambling, too! 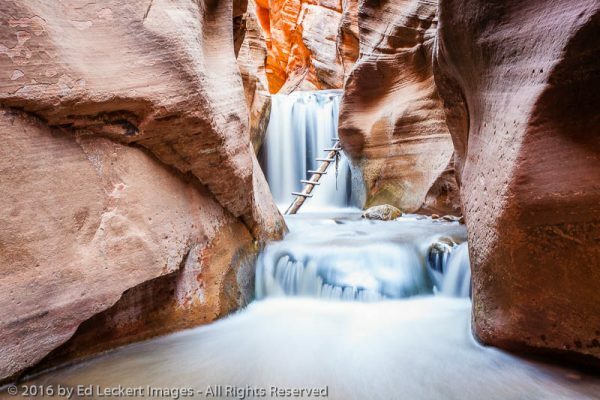 A rickety, slippery, wooden ladder leads hikers past a waterfall in Kanarra Creek Canyon, near Kanarraville, Utah.